Will we ever get tired of watching Cher navigate Beverly Hills high school and discover true love in the movie Clueless? As if! Written by Amy Heckerling and starring Alicia Silverstone, Clueless is an enduring comedy classic that remains one of the most streamed movies on Netflix, Amazon, and iTunes even twenty years after its release. In the first book of its kind, Jen Chaney has compiled an oral history of the making of this iconic film using recollections and insights collected from key cast and crew members involved in the making of this endlessly quotable, ahead-of-its-time production. Get a behind-the-scenes look at how Emma influenced Heckerling to write the script, how the stars were cast into each of their roles, and much more. This wonderful twentieth anniversary commemoration includes never-before-seen photos, original call sheets, casting notes, and production diary extracts. With supplemental critical insights by the author and other notable movie experts about why Clueless continues to impact pop culture, As If! will leave fans new and old totally buggin' as they understand why this beloved film is timeless. 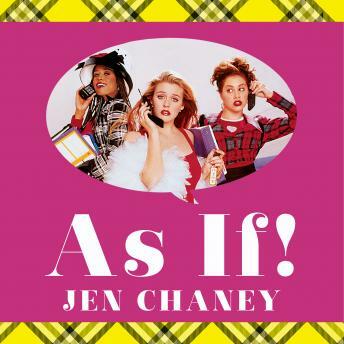 If you loved Clueless this is the book for you! Very interesting and fascinating look behind the scenes. I thoroughly enjoyed and the narration was good and pleasant to listen to.